Hello my lovely readers. I'm very excited and happy to announce that Just Us Girls is teaming up with Petcurean, a Canadian owned family business that brings their customers premium pet food for dogs and cats. Over the next several months we'll be sharing with you tips and recipes to help keep your fur family members healthy and safe. If you've been a long time reader here at Just Us Girls or a follower on Instagram, you'd remember that we use to have a Boston Terrier named Izzy. Sadly she is no longer with my family. 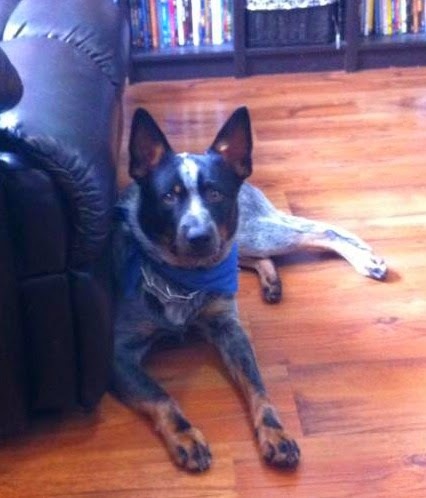 We do however have a new fur family member, a Blue Heeler, puppy. His name is Max and he is just over a year old. He was born last February. We received him in April, so our anniversary with him is coming up. My kiddos are very excited to make special dog treats for him and I'm excited to try some new recipes with him thanks to Petcurean. Winter may be almost over, but those of us that are on the East Coast know that we still have to worry about the cold weather and snow. It doesn't seem like it will be getting warmer any time soon. Although Max is an inside dog, he still loves the outside and he's outside more during the warmer seasons. With the weather being this cold we try not to have him out more then 20 minutes at a time during the day. It's normally less than that because he is not a fan of the cold, neither am I. Twenty minutes gives Max plenty of time to take care of business and to run around for a bit, he loves playing in the snow. It takes more energy to stay warm when it's cold outside for animals, so make sure they have plenty of water to stay hydrated and also make sure to not leave their water outside. It can easily freeze and no dog wants to chew frozen ice to get to their water. Dogs that are mainly outdoor pets eat more during the winter and those that are mainly indoor dogs have different needs when it comes with feeding them. Indoor dogs conserve energy by sleeping more. Dogs also exercise much less when they do go outside, so you may need to adjust the amount of food you give your pet so they don't gain too much weight. For information about choosing the right food for your pet, be sure to head over to www.petcurean.com.